In my parents’ house no pet was allowed to enter, and I didn’t feel particularly deprived for that. Then I met Mario. He lived in the country at the time and was just starting to make his dream come true: breeding Arabian horses. Moving to the country with him was quite a change for a city girl like me, who used to live and work in a city like Milan, at the time described as ‘Milano da bere’, Milan to be drunk!, at the end of the roaring 80’s. Animals have been an integral part of our lives ever since. Breeding purebred dogs means moving in the opposite direction of Nature, that proceeds favouring the survival of the fittest and ensuring adequate genetic diversity. 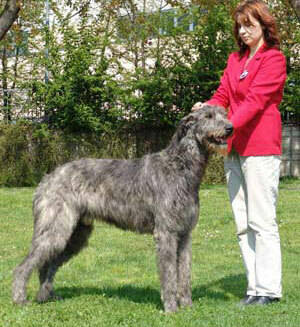 Actually, one can choose to breed at the lowest level of consanguinity, but this technique can’t guarantee any improvement on health and longevity in the Irish Wolfhound, a rare breed with a restricted genetic pool. The only possibility for the breeder is to be strictly selective so as to reduce any risks implied in purity of breeding. Only the most efficient, most harmonious, best-balanced reproducers must be considered for mating. Today’s breeders aren’t looking for a dog that can hunt and kill either wolves or big ungulates; this doesn’t mean we shouldn’t aim at a dog that can walk long distances or on rugged grounds; a dog that can mate naturally and deliver and grow puppies correctly; a dog that can live in a family context including urban areas, without creating problems. 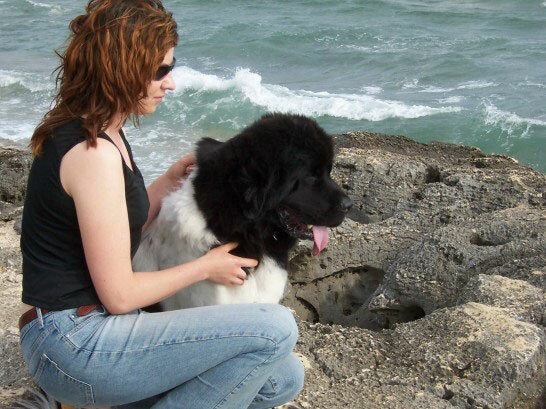 I chose to go back to Nature for what concerns feeding, good care and daily management of my dogs. I try to operate a strict selection, with the support of veterinary check-ups, by feeding them with fresh raw food, by following a vaccination plan respectful of the dogs’ immune systems, by abolishing cages, by making them have adequate exercise. My project requires more energy and money than the ‘classical’ method. Is my effort rewarded? Am I breeding only beautiful healthy dogs? Let’s be honest, it isn’t always so; however, breeding this way is much more interesting, and in the end our efforts pay off. 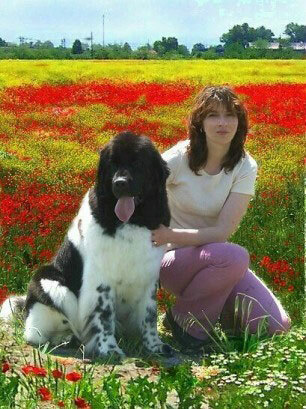 Iwonna is a friend of mine, and a capable sensitive breeder and dog-lover. She’s the one who handles my dogs in shows, grooms them with great skill and with patience and ability takes care of the anxiety of dogs that aren’t accustomed to being handled by strangers, to standing still for endless moments or running in the smallest rings. Without her precious help, I would have totally quitted this show business I still attend sparingly. 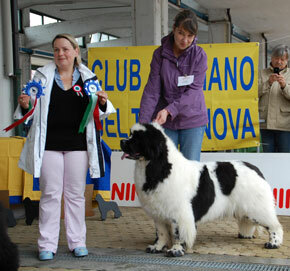 Iwonna is a successful breeder of black and white Newfoundlands. In the course of the years I could appreciate her severe, deeply ethic breeding methods. Why have I gone and still keep going to Dog Shows? I decide to go to shows when I think I’ll spend a pleasant day there; when I suppose I’ll see interesting dogs; when I hope the judge might teach me something new. I decide to go to shows because I can see my dogs well trimmed and well stacked, so I myself can judge them from the ringside while Iwonna is handling them. Some shows I went to were particularly meaningful, not only when I was winning but also when realizing my limits as a breeder. Being too passionate about competitions is a dangerous thing for breeders. Competitions are an instrument, I think, not a goal, so I try not to exceed with them; after all, one must remember that a dog is much more than its aesthetic aspect!